Each year, 45+ Blue Water Task Force labs collect over 6,000 water samples nationwide. After the results from each water test are recordered the data are posted on the BWTF website, and each chapter has their own approach for communicating their data out into the community so people know where it’s safe to surf, swim and play in the ocean. Below are a variety of ways chapters are increasing public awareness of their data, local water quality issues and the importance of their monitoring efforts. The easiest way for chapters to reach a broad variety of users is by sharing water quality results on social media. 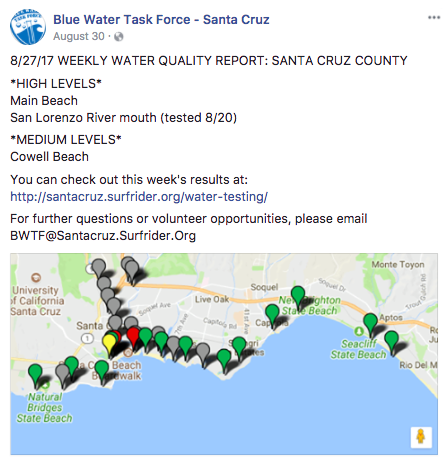 Once results are posted to the Blue Water Task Force data page and map, it is easy to share them to Facebook, Instagram, and Twitter pages. Chapters often include a short synopsis of the results. Posting water quality information on social media provides a platform for community members to share those results themselves, comment, ask questions, and tag their friends so they can learn more. For example, check out these examples below from the Santa Cruz, Eastern Long Island, and Oahu Chapters. 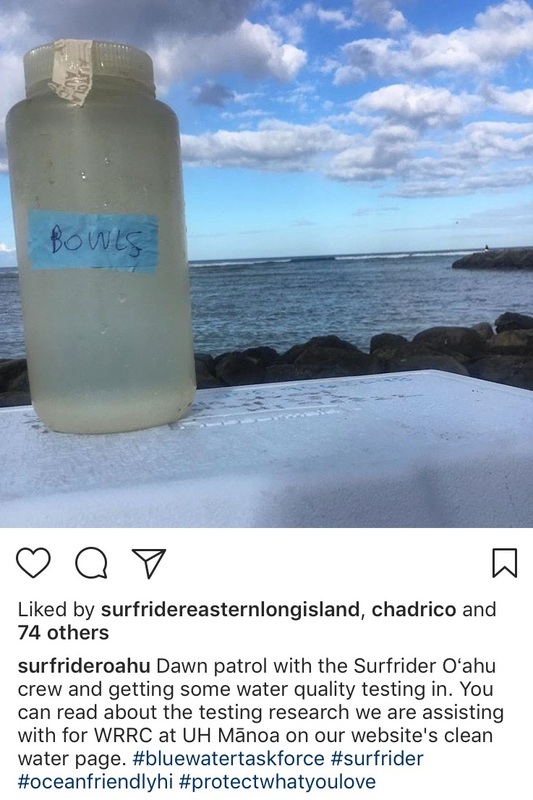 Here’s an example of an Instagram post by the Oahu Chapter that points people to the website for more information about their sampling program. Hint for instagram users: it’s possible to link multiple social media feeds to an instagram page so that when you post to the app, it is also shared to all other social media platforms. Some chapters send out “Water Quality Alert” emails to chapter and community members who subscribe, putting important water quality data right in people’s inboxes. By emailing community members directly, this provides an easy way for people to reply and ask questions. Many chapters also include local agency staff and elected officials on their email distribution list so they can keep track of their chapter's results and any trends that might develop indicating potential public health risks. Community presentations are a great way to invite any water-oriented community members to the room to educate them about a chapter's Blue Water Task Force program, local water quality issues and what solutions are needed to solve pollution problems. Community presentations can also be a great way to attract new volunteers and financial support for volunteer monitoring programs. For example, check out Stena from the South Sound Chapter. Because many South Sound sampling sites overlap with popular diving locations, Stena gave a presentation to the SCUBA club to educate divers about the impacts of pollution in Tacoma, Gig Harbor, and the southern Puget Sound region. 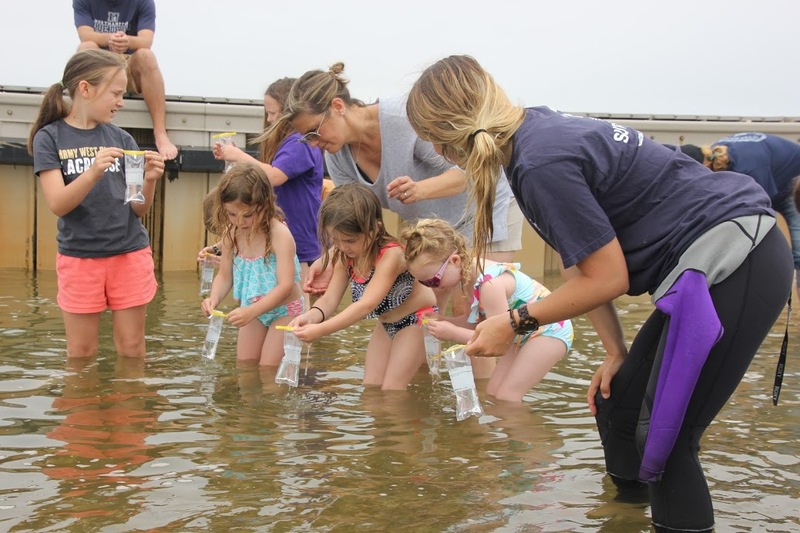 The Eastern Long Island Chapter routinely holds water quality workshops with both children and adults meeting down at the beach to teach participants how to collect a water sample and to discuss local water quality problems and how we can all pitch in to be part of the solution. Community presentations provide a great opportunity to tie problems to solutions that everyone can get involved with to support clean water. 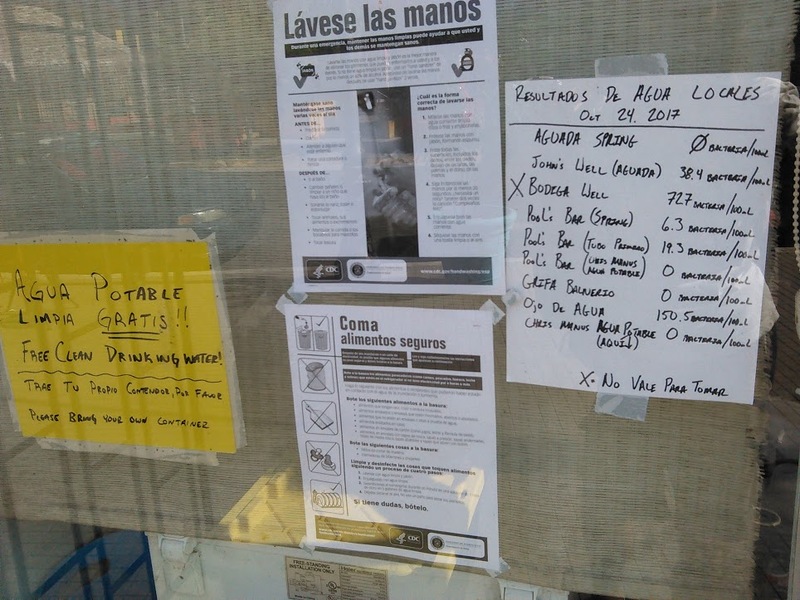 Many chapters have found it helpful to print out posters with a map of their sampling sites and beaches covered and typical, representative data that can be used as a prop at tabling events or community presentations. There is also a Blue Water Task Force postcard located on Surfrider's Brand Portal that chapters can customize to provide info and details specific to their program. 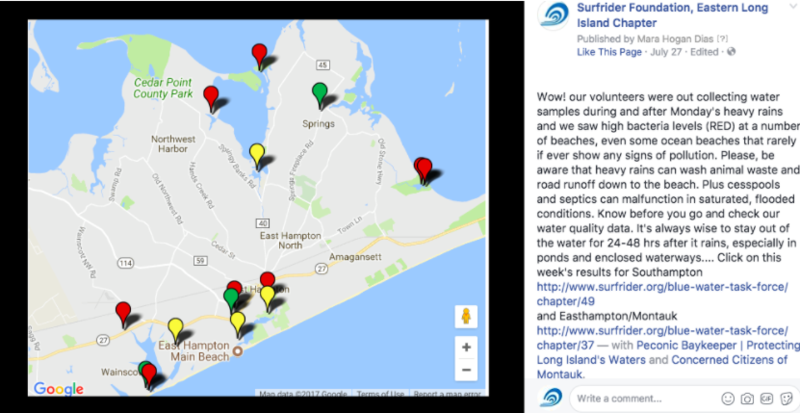 Both the postcards and postcards are useful for directing beachgoers to the BWTF website to find a chapter's data, and also to help guide BWTF volunteers in describing our sampling program, what we test for and why our results are important to all beachgoers. It is always good for chapters to take the time to review their water quality results to identify any emerging trends in their data and to evaluate the effectiveness of their sampling program. Some Surfrider chapters have started writing up annual reports that discuss trends in local water quality and highlight potential problem areas. These reports are generally posted on the chapter's BWTF program pages on their website providing a good description of the chapter's program to any potential viewers and a more indepth discussion of local water quality trends beyond the most recent results. Chapters are also able to use their annual water quality reports to earn further community awareness and media coverage by senidng to local news groups with a press release. Check out the Blue Water Task Force section of Surfrider’s 2016 Clean Water Report for an example on what a Blue Water Task Force report looks like on the national scale. Some chapters have been able to develop good working relationships with reporters from their local newspaper or news outlet and are able to get coverage of their findings or local water quality concerns when they arise. Although there aren't any chapters that are publishing their regular sampling results in the paper, most chapters that do write up an annual report are able to achieve local media coverage. This is important for reaching audiences beyond a chapter usual members and followers. After the series of natural disasters that struck the Atlantic region this year, water quality testing labs - both volunteer and government run- were left without power and the ability to both sample water and to make water quality information available to the public. In response to these natural disasters, Surfrider played a role in getting crucial water quality information to areas left without power. The Rincón Blue Water Task Force program in Puerto Rico began sampling freshwater sources of drinking and household water along with their usual marine recreational sites. Because not all of the community has access to internet connection, the data is posted by hand on community message boards, broadcasted on the radio, and widely distributed by the university. St John in the US Virgin Islands was also hit hard by Hurricane Irma. Surfrider sent Katie Day, a staff scientist to get their water testing program off of the ground. Similar to Puerto Rico, many people in St John did not have access to internet connection so results were printed and distributed to community hubs, local government agencies, through local newspapers, and mentioned at community meetings. 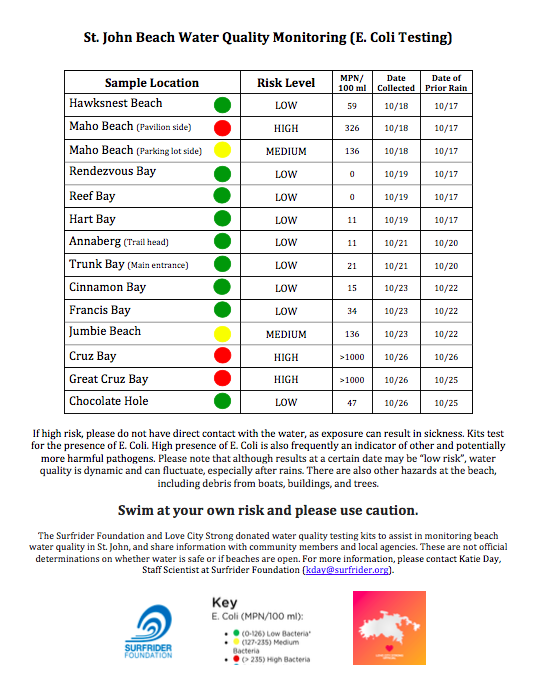 The 35+ Blue Water Task Force labs nationwide strive to provide valuable water quality information to beach communities, because nobody should get sick after a day at the beach. There are a number of ways chapters can ensure that crucial water quality information gets into the hands of the people who need it most. 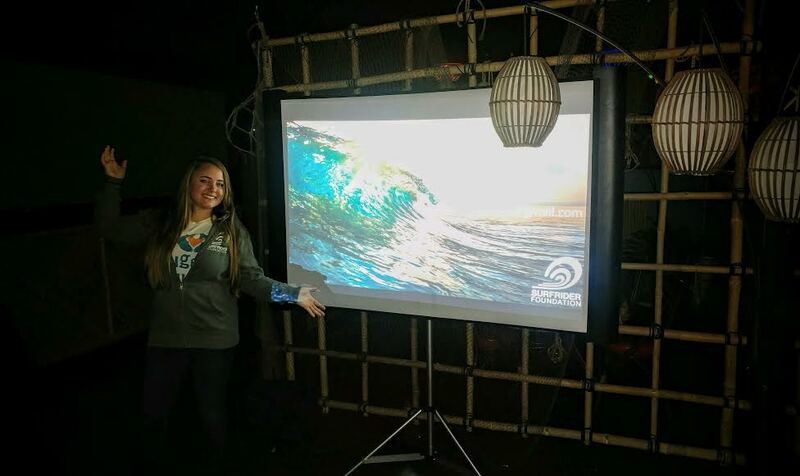 If you have any questions or ideas about how to best communicate Blue Water Task Force data, please email Colleen Henn at chenn@surfrider.org.